This is one of three surviving gunner's rules by Humfrey Cole, two of which are in the British Museum (see also Epact 47296). 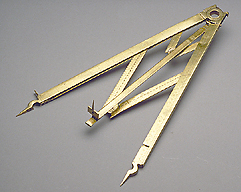 They offer a wide range of applications beyond those of an ordinary folding rule which makes them a valuable instrument in surveying, gunnery and trade. The instrument is undated, but comparison with other instruments by the same maker allows it to be dated to circa 1580. In contrast to the scales found on other Humfrey Cole instruments, those found here are inaccurately engraved and laid out.